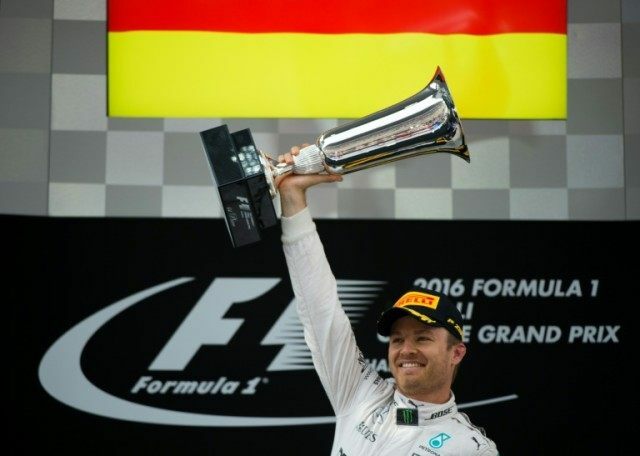 Shanghai (AFP) – Nico Rosberg stormed to victory in a chaotic Chinese Grand Prix on Sunday, methodically completing a hat-trick of wins to extend his perfect start to the 2016 Formula One season. The German’s Mercedes was jumped at the start by Daniel Ricciardo but after avoiding the first-corner mayhem unfolding behind the front two, he quickly caught the Red Bull and romped home to win by a whopping 38 seconds from Ferrari’s Sebastian Vettel. Reigning world champion Lewis Hamilton began from the back of the Shanghai grid after a mechanical failure on his Mercedes sabotaged qualifying for the Briton on Saturday but he roared back to take seventh, despite pitting early to replace a damaged front wing. Ferrari’s wretched fortune continued after Vettel and Kimi Raikkonen collided at the first turn, allowing Daniil Kvyat’s Red Bull to slip past into third, which is where the Russian finished. Vettel carved his way back through the field from 15th but blamed Kyvat for driving “like a madman” in a furious rant over the team radio. “Kvyat’s attack was suicidal,” fumed the German, who was still squabbling with Kyvat as Rosberg made his victory speech. The four-time world champion admitted he was fortunate to even finish the race. Meanwhile, Rosberg rammed home his advantage with a superb drive, becoming only the fourth driver to win six consecutive races — joining Vettel (nine), Alberto Ascari (seven) and Michael Schumacher (six) — after winning the last three of 2015. If Rosberg’s wins in Australia and Bahrain were shrugged off by Hamilton, his 17th career victory underlined how far momentum has shifted since Hamilton captured his third world title in Texas last October — the last time he won a grand prix. Hamilton last started a race from the back of the grid in Hungary two years ago when he stormed back to take third. After an engine change, Hamilton produced a brave attempt to repeat his 2014 heroics but lightning never looked like striking twice, especially after mangling his front wing in the early skirmishes. Rosberg, though, was unstoppable once he had blown past Ricciardo at the exact moment the Australian’s left rear tyre shredded off and landed in strips on the track, bringing out the safety car to throw Hamilton and Raikkonen a lifeline after their troubled starts. Ricciardo finished a creditable fourth after recovering from his puncture with a swashbuckling drive, while Raikkonen fought back for fifth with Felipe Massa’s Williams sixth in front of Hamilton.